Born in 1924 in Simla, Ram Kumar was among India’s leading modernists. He studied Economics at St. Stephen’s College, New Delhi, in 1946. Following this, he went to Paris to study painting under Andre Lhote and Fernard Leger in 1949-1952. Ram Kumar, like many of his confreres among the first generation of post-colonial Indian artists - including such figures as F N Souza, M F Husain, Paritosh Sen, Jehangir Sabavala, Krishen Khanna, S H Raza and Akbar Padamsee - combined an internationalist desire with the need to belong emphatically to their homeland. In its internationalist mood, this generation looked to the early 20th-century modernisms of Paris, London and Vienna for inspiration; its need to belong prompted an interest in the construction of a viable ‘Indian’ aesthetic that bore a dynamic relationship to an Indian identity. With Ram Kumar, this quest for an indigenist tenor has not meant a superficial inventory of ‘native’ motifs offered as evidence of a static and essentialist Indian identity. Instead, as I have already suggested, he demonstrates that a painter can enact the innermost dramas of his culture while maintaining the individuality, even idiosyncrasy of his performance. Ram Kumar’s art, which has proceeded through an alternation of joyous expressivity and brooding reticence, plays out a crucial polarity of emphasis in the context of Indic culture: that between samsara, the sensual participation in the world of events, and nirvana, the ascetic blowing-out of desire. Having renounced the active engagement with the state and civil society that had earlier characterised his position, the artist has turned gradually inward, choosing to be an internal exile of the spirit. This withdrawal affords him the space in which to reflect upon the great natural forces that have enthralled him since his childhood, to gauge their metaphorical import: in their workings, he senses the deeper intrigue of time as kala, the destroyer of worlds. Attentive to the ceremonials of decay, alert to the processes of transformation, he stands on that threshold where the anguish of the private self is sublimated into the universal rhythm of creation and destruction. If Ram Kumar’s art has been a journey from city to landscape, from the grihasta’s social obligations to the sanyasin’s peripatetic freedom, it has also been an art of looking back, an art of reminiscence. As he departs from places he has known intimately, the artist takes with him spasms of agitation that he will recollect in tranquillity; so that the images that time has shattered may be set right, and words lost to the wind may be strung together, again, in chants. Do we see evidence, in Ram Kumar’s most recent work, of a reconciliation between householder and renouncer, city and landscape? In the paintings that he has executed since the late 1990s, the architecture of the tomb has been replaced by the architecture of the temple-town built by the river. This is surely a Varanasi idealised as tirtha, the ford that signifies a place of pilgrimage in Indic culture: the point where settlement meets openness, and the pilgrim self makes the crossing from locality to cosmos, the earthly to the transcendent, time to eternity. Ram Kumar’s recent paintings attest, also, to another kind of reconciliation: since the aesthetic experience belongs, eventually, to the realm of samsara rather than that of nirvana, it cannot be defined by severity of structure alone; the impulse towards the voluptuary insinuates itself even into the sternest asceticism. Motivated by one pole of his sensibility, Ram Kumar has often acted as an ‘inquisitor of structures’ (the phrase is Wallace Stevens’), translating the earth in the idiom of the surveyor’s map, so that a topographical code of contour lines and benchmarks constrains the deep saturations of the landscape. But he has also been tempted to oscillate to the other and romantic pole of his sensibility: taking a passionate and unabashed delight in the physicality of the vista, its capacity for moodiness and unstable beauty, he has celebrated the flush of magnolias in bloom, the gravid slopes borne down by clouds. The dialogue between these opposite poles has grown richer, and replenishes Ram Kumar’s oeuvre: his stringent geometry and his contemplation of mortality now yield primacy to the celebration of sensuousness, the solace of the beautiful. 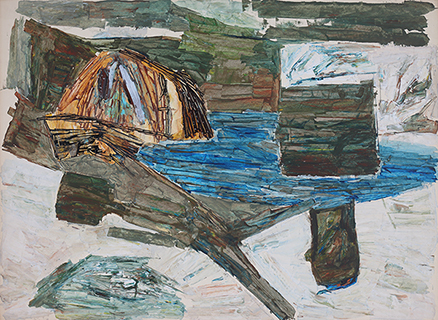 The true subject of Ram Kumar’s art, perhaps, is the landscape as Beloved. In responding to the palpable eroticism of graze and blur, the stippling and studding of textures across these painted surfaces, we share his manifest rapture, his sense of stepping outside himself to attain communion with the Beloved. The artist passed away on 14 April 2018. Born in 1924 in Simla, Ram Kumar was among India’s leading modernists. He studied Economics at St. Stephen’s College, New Delhi, in 1946. Following this, he went to Paris to study painting under Andre Lhote and Fernard Leger in 1949-1952.